On Saturday I attended the opening year leadership training at my local church. Almost 150 people turned up to hear how we can be a more welcoming church. I will get to what we talked about later in the post but I want to share three stories with you first. A Church – On Sunday I was speaking to a friend of my who is new to their local church and I asked him how it was going. He said that whilst they were making every effort to keep going it was getting harder to stay at this church because nobody talks to them. This particular Sunday not a single person had spoken to them yet there were many families attending just like them. Hardware shop – Whilst I still had the thoughts of Saturday and the experience of my friend going through my mind, on Monday I went to my local hardware mega store – Bunnings. When I got to the front door the lady at the front said “hello and welcome to Bunnings.” Whilst I thought it was nice I knew that that was her job. As I went around the store every single employee stopped to say hello to me and asked me if I needed help. What impressed me the most was the welcome I got from people who were not officially on welcome. My Church – on sunday at my church I exchanged the sign of peace with a mother I met on Family camp, spoke to a doctor I had never met after the service, had coffee with one of the dads from our small group and on the way out said hello to a stranger who I thought was coming for the next service. Why is it that I get a warm welcome at my local Hardware store and nobody talks to my friend at church? If the experience of my friend was a once off I wouldn’t have to write this article but the fact that many people feel unwelcome in many churches and in many denominations tells us that we have a welcome problem in Church. It is important to remember that in this era of front door greeters at every department store, people are immune to the person on the front door. Many churches put all their welcome effort into the person on the front door yet the people in the pews keep to themselves. Our churches have to training everyone to have a spirit of welcome not just the people rostered on to welcome. Inviting – many churches are not inviting yet they say they are welcoming. We have to go beyond hoping that someone will walk through the front door on Sunday; we have to ask them to come on Sunday. Your church needs to encourage people to feel welcome at your church before they have even made it into the car park. People should feel welcome at your church because they were invited to a service. 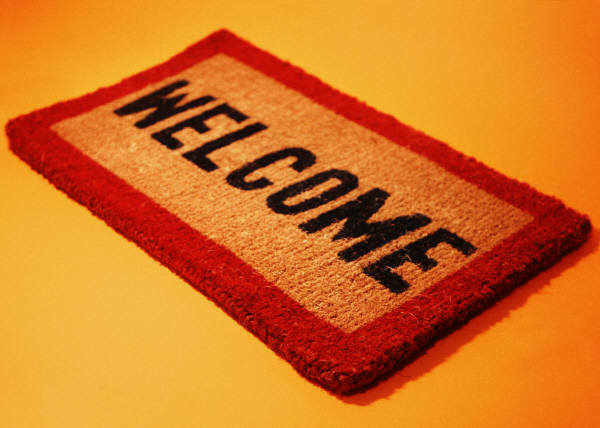 Welcoming – once people invite their friends to church the entire church must be welcoming. It is not up to the welcome team or the greeters or the priest to do the welcome. People are waiting for someone in their pew to say hello. Create opportunities for people to talk before the service starts, during the exchange of peace, after the sermon or homily and after the last song when the service is finished. People can come to a quiet church any day of the week other than Sunday; Sunday is the time for community interaction not private devotions. Befriending – if people get invited to come to church, the come along and feel a sense of welcome but nobody ever makes friends with them then they won’t stay very long in your church. As important as welcome is befriending new people is even more important if you want them to stay in church longer than a couple of weeks. If you want to disciple new people that come to your church then you have to befriend them and be in relationship with them. This is just the tip of the iceberg in creating a welcoming church; it won’t happen over night and you have to keep working on it.